My oldest daughter, Olivia, turns 12 this month and I just can’t get over how quickly time flies! It seems like just yesterday that she was still in diapers and now she is a tween (and a teenager next year- yikes!). She has taken more of interest in the last few years on her appearance and wants to be dressed in style. She is more fashion conscious than I was at her age that’s for sure! Companies like z2wear that sell tween clothes are perfect for her! At z2wear, you can find high end girls clothes and accessories that are hip and chic and made just for this new generation of girls like Olivia. They have such a nice selection and I could picture Olivia in all the fun outfits. The designer, Johnetta Boone is so talented and you can really tell she loves what she does as you look through the z2wear catalogue. We received the z2 sack in denim for review. Olivia was very excited when I told her it was her new bag. The first words out of her mouth were, “oh its so pretty!”. I agree, it is a beautiful bag. The material is a dark blue denim with pink stitching and is studded with rhinestones on the side. Love the bling! The Z2wear logo is embroidered on the outside pocket so everyone will know what kind of bag it is. 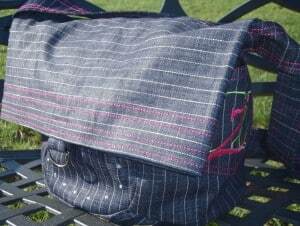 Besides being a chic messenger bag, its also quite roomy. 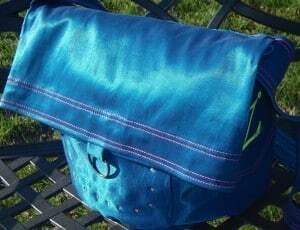 It has a front flap so the bag can be closed or it can be tucked in for the open look. Olivia uses hers as a purse and stashes her magazines, CDs, etc and it also serves as an overnight bag when she goes to sleepovers at a friend’s house. If you are looking for a well made, high end bag that your tween will love, then check out the selection at z2wear. This particular bag retails for $78 and also comes in Turquoise Shark Skin. Olivia loves her new bag and brings it with her everywhere. 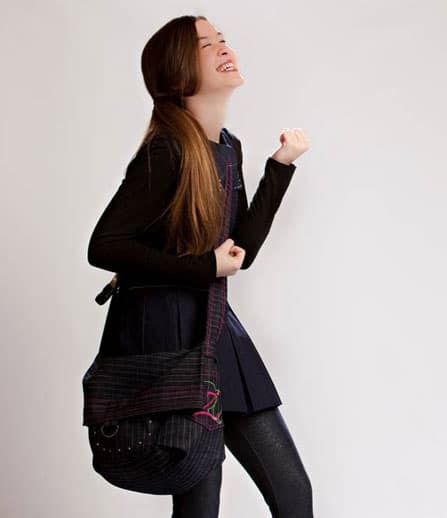 If you have a tween girl, then check out z2wear and see the collection!